You walk under the glowing archway, joining the crowd entering the zoo. After all your hard work planning and building, the zoo is finally a reality. A gust of wind rustles your hair as a monorail passes above you. You smile as you watch children pull their parents up to the glass of the dinosaur enclosures, eyes wide with wonder. In the center of the zoo, a large glass enclosure towers above the guests. A roar echoes out. A rhythmic thumping shakes the ground. Stepping out from the shadows, the light hits the mighty T-Rex as it eyes the people through the glass. Welcome to Mesozooic. The age of the dinosaurs is back—this time safely behind glass! Draw in guests from far and wide to see dinosaurs at your zoo. Select features to build and race against the clock to quickly construct your zoo’s layout in this real-time card game. 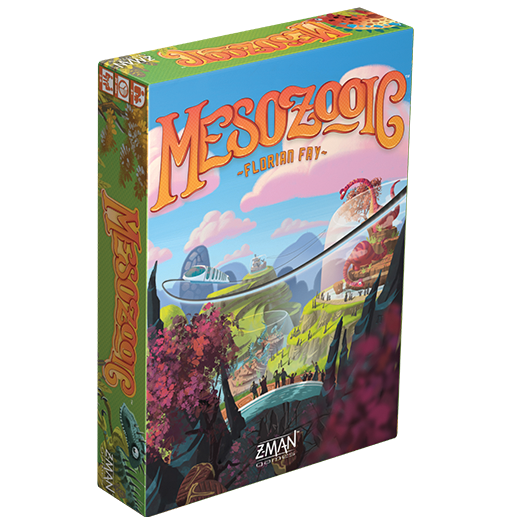 Perfect for parties and family game nights, Mesozooic is available for pre-order now through our website or your local retailer! Dinosaurs are back and the world is clamoring to see them! In Mesozooic, it’s your job as the director to plan and construct a zoo that will surpass any others. Fill your zoo with a variety of crowd-pleasing features: wow your visitors with towering dinosaur enclosures, entertain them with prehistoric attractions, and let them travel around the zoo in style on a network of monorails. Over the course of three rounds, players will draft the most desirable features into their hand, piece their zoo together in real-time, and score each layout to see who has created the best zoo. After drafting your favorite features, you’ll have to organize them in your zoo—but things won’t always go as planned! Race against time by frantically sliding the cards one at a time to match up features and optimize your zoo’s layout. Complete dinosaur enclosures, connect monorail tracks, and maintain your attractions to score points. The zoo with the best layout will score the most points! When drafting cards, you can choose to customize your zoo however you like. Choose from attractions, monorails, dinosaur enclosures, or topiary. Guests will be dazzled by the larger-than-life attractions at your zoo. Pterodactyls soar through the aviary, dinosaur eggs hatch in the nursery, and underwater creatures swim through the bright blue waters of the aquarium. Your zoo can include any or all of these attractions! To keep things running smoothly, attractions need to be regularly maintained. In order to score attractions in your zoo, you must keep a maintenance truck next to the attraction. While visiting your zoo, guests will need to get around. Hopping on the monorail will quickly transport your guests to other corners of the park. In order to be effective, the monorail’s route must be connected. If you can continue the track, each connection will score points for your zoo. The highlight of the zoo is, of course, the dinosaurs themselves! Let guests come face to face with these creatures from another age. Create the perfect environment for gentle herbivores or powerful carnivores, each in their own enclosure. Each completed enclosure will score points. Once you’re ready to take on a new challenge, add in advanced features such as virtual reality simulators, larger dinosaur enclosures, or the mighty T-Rex. We’ll go into more detail about the various exciting effects that advanced cards bring to your zoo in the coming weeks, so stay tuned! Careful planning and quick thinking can give you the edge. Astonish guests with the amazing creatures from a land before time. Will guests flock to your dinosaur zoo? Pre-order your copy of Mesozooic today and start building!